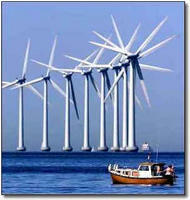 Nantucket, PA - Local residents here continue to protest a proposal to install giant windmills off the coast of Cape Cod. 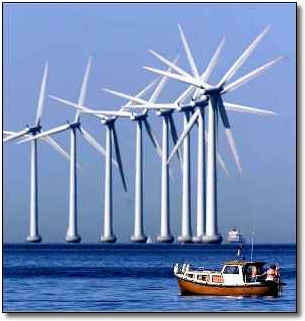 The giant turbines would produce 480-megawatts of power - enough to provide 75% of the electricity in the area. "Don't get me wrong, I'm all for conservation, clean energy and less dependence on foreign oil and nuclear power, " said Bob Johnson, local millionaire and homeowner, "I just don't like the look of the things." Robert F. Kennedy Jr., a noted conservationist, has joined the fight to stop the windmills. "Why can't we put these things in the desert or somewhere that poor people live? We rich people are always in favor of conservation as long as it doesn't affect our property values. It's bad enough we have to stomach the tourists. Seriously, I've been preaching about energy conservation for years but that doesn't mean I'm willing to make any sacrifice! C'mon!"